Eskuche makes his debut release on German Brigante and Franz Noiser’s label Series Music bringing NYC style dancefloor-friendly tones to this imprint based out of Spain. 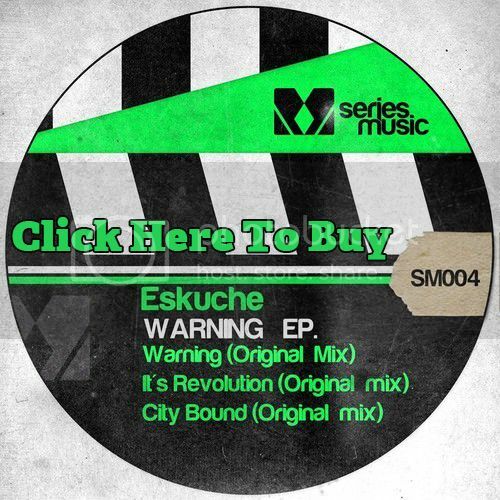 ‘Warning’ starts off with “City Bound”, featuring a slick urban sound steadily building into some heavy Tech House beats. Next comes “It’s Revolution” that continues with that slick urban sound and more mellow undertones. Finishing the EP is “Warning” with a more tribal sounding build-up that makes a smooth transition into a groovy melody. Eskuche is a New York City based up and coming DJ/Producer who has played at such legendary clubs as Cielo, Pacha, and was a resident at the recently closed Sullivan Room. His music skillfully combines contemporary sounds and signature grooves that form a unique sound concept. He has releases on Nervous, Zeitlos, Factomania, Tlk, SunSun, Blend It, and Magnetized and has received support from Marco Carola, Maya Jane Coles, Dubfire, Laurent Garnier, Joseph Capriati, Loco Dice, Richie Hawtin, Stacey Pullen and many more!